When it comes to development along the Las Vegas Strip, 2017 might be remembered as the comeback year from the Great Recession. Several casino construction and improvement projects are underway or are slated to start by the end of the year. Planning and drawings are about to kick into high gear for the construction of a $1.9 billion football stadium near the south Strip if the NFL approves a relocation of the Oakland Raiders this spring. The deal hit a snag Jan. 30 when the family of Las Vegas Sands Corp. Chairman and CEO Sheldon Adelson withdrew as investors in the proposed 65,000-seat domed football stadium. The family had pledged $650 million toward construction. The Raiders would commit $500 million, and $750 million would come from public money. Reports cite Raiders representatives as having a commitment by Goldman Sachs to fund the project without the Adelsons’ money. Some community leaders have expressed skepticism that Goldman Sachs can fill this financial void. Meanwhile, Stadium Authority officials have said they will continue to work with the Raiders to develop the project. Construction could begin this year or 2018, depending on when and if an NFL team is secured. The $1.4 billion expansion and renovation of the Las Vegas Convention Center won’t begin by the end of 2017 as was suggested in the fall but is on track for early 2018. It’s not the heyday of development along the Strip, but the sight of any construction crane is a good sign for the first megaresort under construction since the Cosmopolitan opened in 2010. Construction on Resorts World Las Vegas has been on hold by Malaysia-based Genting Group, which plans a $4 billion, 3,000-room resort with a Chinese theme. The company has been cryptic about its plans but is giving hints work will be ramping up. “We are in the process of preparing to fully mobilize the exciting Resorts World Las Vegas project, and you can expect more widespread site work to begin towards the end of (the first quarter of 2017),” according to a statement from Michael Levoff Sr., vice president of public affairs for Genting Americas, on the former Stardust site. 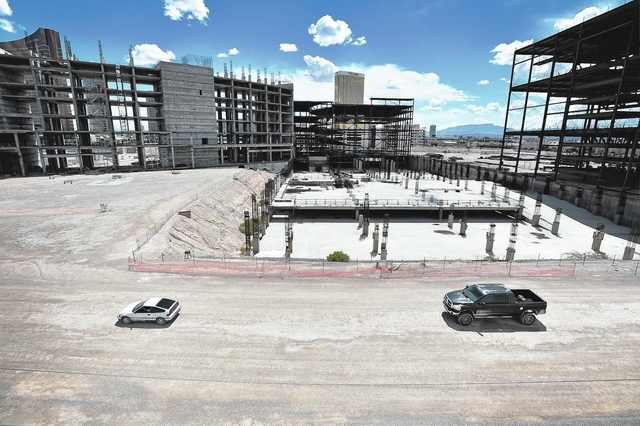 Construction was expected to begin last fall on the one-time Echelon project of Boyd Gaming, which shut down work in 2008 and later sold it to Genting in 2013. No opening has been announced but the company has previously said it would be ready in 2019. That’s good news for that end of the Strip. In December, Australian-based Crown Resorts pulled out of the Alon Las Vegas resort project near the Trump International Hotel. Alon is exploring other options after their principal financial backer pulled out. Wynn Resorts said it might start construction by the end of 2017 on its $1.5 billion Paradise Park development behind the Wynn and Encore. It will feature a 38-acre lagoon, convention space and hotel. MGM Resorts International is in the midst of a two-year makeover of the Monte Carlo with a price tag that has been pegged at $450 million. It was slated to be completed by the end of 2018 under the name Park MGM and have 2,700 rooms. MGM is undertaking a $154 million expansion of its convention space at Aria where it is adding 200,000 square feet. That project was expected to be completed in early 2018. Work may not start until early 2018 on the 600,000-square-foot exhibit hall expansion at the Las Vegas Convention Center. Other convention space also will be renovated. That’s welcome news since Las Vegas hosts 22,000 meetings and conventions supporting 60,000 jobs for a $9 billion industry, said Jeremy Handel, senior director of communications for the Las Vegas Convention and Visitors Authority. An oversight panel recently held its first meeting and a plan will be put together and proposals sought for architects to begin designing the plan, Handel said. The convention center expansion and stadium projects by themselves are expected to create more than 14,000 jobs. The two projects will have an annual incremental economic impact of $1.43 billion and will attract 1 million additional visitors a year. Work continues at McCarran International Airport on a D Concourse and Terminal 3 tunnel expansion. The airport is converting an eight-gate wing of the D Concourse from domestic use to swing gates that can handle domestic and international arrivals, according to airport officials. The concourse is set up to handle larger aircraft and more international gates are needed, officials said. The tunnel will be nearly 1,000 feet long and connect the northeast wing of Concourse D to Terminal 3’s existing corridor. It will include four moving walkways. Construction on the $51 million project started in the first quarter of 2016 and will be completed this spring when the gates are used. The Las Vegas Business Press is owned by the family of Las Vegas Sands Corp. Chairman and CEO Sheldon Adelson.